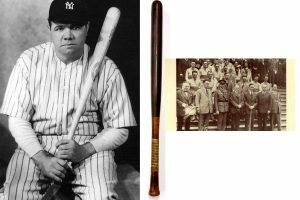 A baseball bat given by Babe Ruth to the GAA comes up at Fonsie Mealy’s Rare Book and Collectors sale at the Ormonde Hotel in Kilkenny on May 2. The most famous of all players Babe Ruth’s career in major league baseball spanned 22 seasons from 1914 to 1935. He gave this original Spalding B12 baseball bat to Frank McGrath, manager of the Tipperary team, on their visit to the US in 1926. The handle grip is stamped 35″. Lot 812 also includes a gold shield shape stamped on an enamel inset medal to commorate Ireland v. America, Polo Grounds, May 30th, 1926. The lot comes complete with a manuscript provenance letter from the family and is estimated at 4,000-6,000. This entry was posted on Monday, April 16th, 2018 at 2:22 pm	and is filed under AUCTIONS, COLLECTIBLES. You can follow any responses to this entry through the RSS 2.0 feed. You can leave a response, or trackback from your own site.